The Office of Admissions is working on an admissions training guide. For training on graduate admissions processes, please reach out to your graduate evaluator. The University Graduate School (UGS) is pleased to announce its 2018-2019 funding initiatives to help enhance the recruitment and research colloquium efforts of PhD granting units at the university. To learn more about the initiatives, the proposal process and eligibility criteria, please click on the links below. The proposal submission deadline for 2018-2019 is June 1, 2018. Individuals who teach graduate level courses (5000 and above) must be approved by the department chairperson after a review of the individual’s credentials. The expectation is that individuals teaching graduate level courses will hold a terminal degree in the discipline in which they are teaching or in a related discipline and demonstrate a high level of competence in teaching and scholarship. Substitution for the terminal degree may be granted with documented exceptional experience and/or scholarly or creative activity when approved by the chairperson, the unit dean and the Dean of the University Graduate School. Initial appointments will be for up to seven years, or until the next scheduled post-tenure review if that comes in less than seven years. Reappoint­ment to the Graduate Faculty will be evaluated at the time of the seven-year post-tenure review, or in the sixth year of appointment for Graduate Faculty not tenured. Individuals appointed as Graduate Faculty with Dissertation Advisor Status will be expected to show higher levels of scholarly productivity or creative activity; more extensive involvement in professional activities; successful mentoring of graduate students as evidenced by, for example, time to degree, post-degree appointment, publications from thesis or dissertation; and, in all disciplines in which external funding is available, i.e., most disciplines, evidence of acquiring external funds sufficient to support the research of their graduate students. Initial appointments will be for up to seven years, or until the next scheduled post-tenure review if that comes in less than seven years. Reappoint­ment to the Graduate Faculty with Dissertation Advisor Status will be evaluated at the time of the seven-year post-tenure review, or in the sixth year of appointment for Graduate Faculty not tenured. The Dissertation Advisor Status Evaluation Committee is composed of fifteen members of the Graduate Faculty holding Dissertation Advisor Status. This Committee is elected from all units of the University offering doctoral education with representation proportional to the number of Graduate Faculty with Dissertation Advisor Status in the various units. Each College, or School not within a College, offering the doctoral degree will have at least one faculty member but no more than seven members on the Committee. Graduate Faculty in each department nominate one Graduate Faculty member for election to the Dissertation Advisor Status Evaluation Committee when there is a vacancy from that College or School. Terms are for two years with eight members replaced in even numbered years and seven in odd numbered years. Faculty within a given College or School vote only for representatives from that College or School. To be eligible to serve on thesis or dissertation committees an individual must be a member of the Graduate Faculty. To chair a thesis committee, an individual must be a member of the Graduate Faculty and employed by Florida International University. Members of the Graduate Faculty not employed by Florida International University may serve as co-chair of a thesis committee. To be eligible to serve as the chair of a dissertation committee, an individual must be a tenured or tenure-earning faculty member, be a member of the Graduate Faculty, and hold Dissertation Advisor Status. Graduate Faculty members holding Dissertation Advisor Status who are not tenured or tenure-earning faculty members may serve as co-chair of a dissertation committee. The departmental chairperson will notify the unit dean and the Dean of the University Graduate School of the individuals approved to teach graduate level courses. For individuals who are not tenured or tenure-earning faculty, a copy of the individual’s CV must be filed with the University Graduate School at the time of notification, and prior to the individual teaching the course. Individuals without a terminal degree but with extensive practical experience in a specific area may be proposed by the department, endorsed by the unit dean, and approved by the Dean of the University Graduate School to teach only in that specific area. The graduate dean may solicit a review of the proposed individual’s credentials by three experts in the discipline from outside the University. An individual who does not hold a post-baccalaureate degree may teach an identified graduate level course only with the specific, prior approval of the departmental chairperson, unit dean and the Dean of the University Graduate School. The approval is specific for the identified course. The graduate dean may solicit a review of the proposed individual’s credentials by three experts in the discipline from outside the University. A committee of at least three tenured and tenure-earning faculty within a department who are members of the Graduate Faculty evaluate the credentials of their colleagues seeking appointment or reappointment to the Graduate Faculty. The departmental committee’s recommendation is forwarded to the chair for a recommendation, if the chair is a member of the Graduate Faculty, or for information, if the chair is not a member of the Graduate Faculty. The departmental recommendation is forwarded to the unit dean for a recommendation. The unit dean forwards the application and recommendation to the graduate dean who will make the final recommendation to the Provost who makes the appointment. Individuals with joint appointments will be evaluated in the department in which their tenure, or tenure-earning line resides. In these cases, the other units with which they are officially affiliated will be asked for a recommendation on the application. It is expected that tenured and tenure-earning faculty newly hired at the University will have qualifications appropriate for appointment to the Graduate Faculty. The review process that occurs as part of the search, screen, and appointment process for new faculty will determine eligibility to the Graduate Faculty. Therefore, newly hired faculty will automatically be appointed to the Graduate Faculty after the unit confirms, in writing to the University Graduate School, the name of the new faculty, tenure status, hiring date, and a current CV. 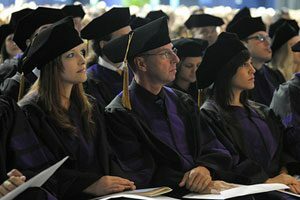 A committee of at least three tenured and tenure-earning faculty within a department who are members of the Graduate Faculty holding Dissertation Advisor Status evaluate the credentials of their colleagues seeking appointment or reappointment to the Graduate Faculty with Dissertation Advisor Status. If there are fewer than three Graduate Faculty with Dissertation Advisor Status in the department, additional faculty holding Dissertation Advisor Status in other departments may be appointed by the Dean of the University Graduate School. The departmental committee’s recommendation is forwarded to the chair for a recommendation, if the chair holds Dissertation Advisor Status, or for information, if the chair does not hold Dissertation Advisor Status. The departmental recommendation is forwarded to the unit dean for a recommendation. The unit dean forwards the application and recommendations to the University Graduate School. The University Graduate School sends the application to the Dissertation Advisor Status Evaluation Committee. This University-wide committee makes a recommendation to the Dean of the University Graduate School who makes the final recommendation to the Provost who makes the appointment. Graduate Faculty from units not offering a doctoral degree are not precluded from obtaining Dissertation Advisor Status. If there are fewer than three Graduate Faculty with Dissertation Advisor Status in the department, additional faculty holding Dissertation Advisor Status in other departments may be appointed by the Dean of the University Graduate School to form the initial evaluation committee. If a department plans to implement a doctoral degree, faculty should apply for Dissertation Advisor Status prior to the implementation of the degree. Newly hired faculty may be involved immediately in doctoral education. Up to two doctoral students may begin working with these faculty with the expectation that the newly hired faculty will obtain Dissertation Advisor Status, and sufficient external funding to support the students, when applicable, prior to the student achieving candidacy at which time the dissertation advisor must be officially appointed. Only faculty holding Doctoral Advisor Status may be appointed as the official dissertation advisor. If a newly hired faculty member does not demonstrate the level of scholarly activity commensurate with Dissertation Advisor Status by the time his or her informal advisees reach candidacy, then these students must be assigned to advisors who have achieved Dissertation Advisor Status. 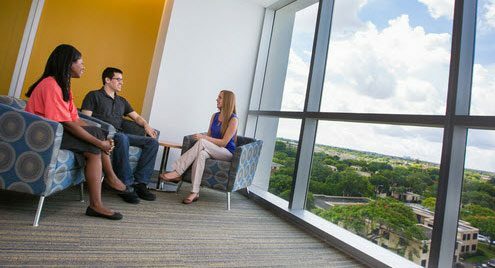 Individuals who are not tenured or tenure-earning but whose primary appointment is at FIU, whether in a department or a Center or other unit, are eligible to apply for Graduate Faculty membership. 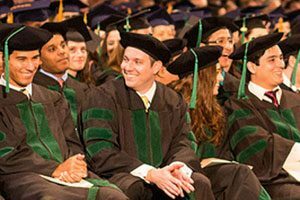 Individuals whose primary appointment is at an affiliated organization are also eligible to apply for Graduate Faculty membership. In each case their credentials will be evaluated by the department most closely aligned with their research. If the research is not closely aligned with any particular department, an ad hoc committee of tenured or tenure-earning Graduate Faculty may be appointed by the Dean of the University Graduate School to evaluate their eligibility. Graduate Faculty from an affiliated organization may not serve as the sole major professor for a thesis. Although a student may work extensively with a Graduate Faculty member from an affiliated organization, an FIU employed Graduate Faculty member must be at least a co-advisor for the thesis. The FIU employed co-advisor must be an active participant in the research of the student, and must accept full responsibility for the student should the non-FIU employed co-advisor relinquish his or her responsibilities. The responsibilities of each co-advisor include helping the student to acquire the funds necessary to conduct the research. Individuals whose primary appointment is at FIU, whether in a department or a Center or other unit, and individuals whose primary appointment is at an affiliated organization, are eligible to apply for Dissertation Advisor Status. Their credentials will be evaluated by the department most closely aligned with their research. If the research is not closely aligned with any particular department, an ad hoc committee of tenured or tenure-earning Graduate Faculty with Dissertation Advisor Status may be appointed by the Dean of the University Graduate School to evaluate their eligibility. Only tenured or tenure-earning FIU faculty may serve as the sole major professor on a dissertation. Other faculty who obtain Dissertation Advisor Status may serve as co-advisor with an FIU tenured or tenure-earning faculty member who holds Dissertation Advisor Status. The tenured or tenure-earning FIU faculty member who is co-advisor must be an active participant in the research of the student, and must accept full responsi­bility for the student should the other co-advisor relinquish his or her responsibilities. The responsibilities of each co-advisor include helping the student to acquire the funds necessary to conduct the research. For the initial establishment of the Graduate Faculty, departmental chairs will meet with the unit dean and the graduate dean to identify three departmental members who best exemplify the characteristics of a member of the Graduate Faculty. These individuals will be asked to complete the appointment form, and upon review, the Dean of the University Graduate School will recommend that the Provost appoint these individuals to the Graduate Faculty. These individuals will constitute the initial departmental Graduate Faculty evaluation committee. Initial establishment of the Dissertation Advisor Status Evaluation Committee will be by election of Graduate Faculty from all units of the University with graduate programs. Graduate Faculty in each department will nominate one Graduate Faculty member for election to the Dissertation Advisor Status Evaluation Committee. Faculty within a given School or College vote only for representatives from that School or College. Schools having no internal departmental structure but residing within Colleges will participate equivalent to a department in this process. The Graduate Faculty members elected by their peers to the initial Dissertation Advisor Status Evaluation Committee will achieve Dissertation Advisor Status by virtue of election. These faculty will serve either one or two year terms as determined by lot. 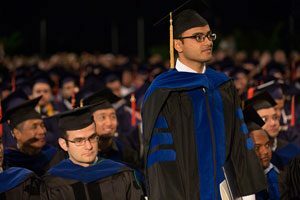 The Graduate Faculty is being established in order to enhance graduate education at FIU. No current graduate student who has a thesis or dissertation advisor or committee already appointed should be negatively affected by the establishment of the Graduate Faculty. Faculty holding advisor or committee appointments for current students will complete these assignments irrespective of the approval or denial of their applications for membership in the Graduate Faculty or the Graduate Faculty with Dissertation Advisor Status. The Graduate Faculty policies and procedures document shall be reviewed each year by the Graduate Council with the intent of modifying or eliminating policies and procedures that prove to be “cumbersome” and to report back to the Senate the status of such review. The Faculty Senate approves the document Graduate Faculty at Florida International University, with its proposed policies and procedures for establishing a Graduate Faculty. Beginning 2019, the Graduate Faculty (GF) and Dissertation Advisor Status (DAS) application process are to be completed via Panther180. Faculty will be able to complete the application with the activities that have already been uploaded onto Panther180. In order to initiate the process, please notify Irene Abad at iabad@fiu.edu that you will be applying for either GF or DAS along with the list of the members of your departmental evaluation committee. * Denotes Dissertation Advisor Status (DAS) and date for scheduled renewal. List includes all Graduate and DAS Faculty Members appointed to date. Applications for graduate faculty and DAS are processed once during fall and spring semesters. The Graduate Faculty and DAS membership were established to enhance graduate education at FIU. To be eligible to serve as thesis major advisor or member on a thesis or dissertation committee the individual FIU employee must be a member of the Graduate Faculty. To be eligible to serve as the chair of a dissertation committee, an individual must be a tenured or tenure-earning faculty member, be a member of the Graduate Faculty, and hold Dissertation Advisor Status. Graduate Faculty members holding Dissertation Advisor Status who are not tenured or tenure-earning faculty members may serve as co-chair of a dissertation committee. All dissertation committee members are appointed by the Dean of the University Graduate School on the recommendation of the unit. The committee is comprised of at least four (4) members of the Graduate Faculty (GF). The major professor must be a member of the Graduate Faculty who holds Dissertation Advisor Status (DAS) and must be an expert in the subject of the dissertation. At least two members of the committee must be from the unit offering the graduate program and one must be from outside of the department or school. Please be aware that the unit may have additional committee requirements. Additional committee members may be appointed. Dr. William F. Humphrey Jr.
Ms. Teresa L. Ponte, J.D. Dr. Larry James Ousley, Jr.
Mr. Jorge L. Esquirol, J.D. Dr. Luther G. Brewster, Jr.